I’d like to say Galen and I are having issues, but really, I’m the one with the issues; my diva dog is living life exactly the way she wants. I’m just not always included in her plans. 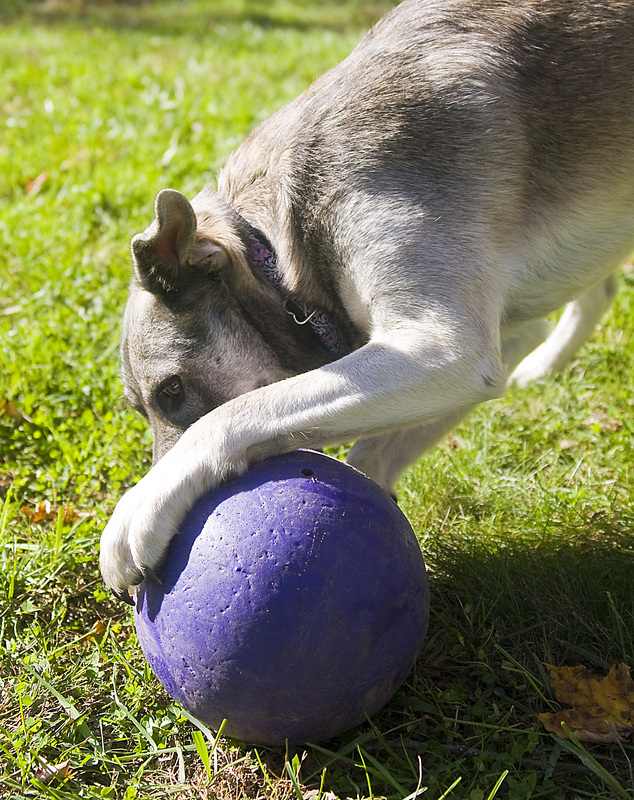 For example, Galen loves to play with these oversized green and purple rubber balls we keep in the backyard. She’s very particular – some days she wants to play with the green ball, only the green ball; some days she wants to play with the purple ball, only the purple ball. And she likes to play her own unique form of fetch, where Kevin or I try to kick the ball out of her mouth as she grips it in her teeth while in a downward dog yoga position. She gives chase either when we knock the ball from her mouth or when we kick it after telling her to drop it. But for a couple of weeks now, she has lost all desire to play ball with me. When we go outside and I say, “Galen, get your ball,” she turns her head away from me as if to say, “I don’t hear you.” But when Kevin comes home at the end of the day, Galen stalks him until he takes her outside. Then she pounces on the ball of the day and chases it all over the yard. Her tail wags, her tongue hangs out, and she wears a huge smile on her face. The other night Kevin had to cut their playtime short because it was his turn to pick up our daughters from dance class. I came outside to replace him, as Galen had a lot of energy she hadn’t yet worked through. I kicked the ball and… she gave me the cold shoulder, just turned away from me. I ran to the ball and kicked it again. As far as Galen was concerned, I wasn’t even there. Galen has also stopped sleeping with me and Kevin, which should make me happy, because I never wanted her on the bed in the first place, but which is actually making me sad. And it’s not like she’s choosing to sleep on our bedroom floor like our previous dog did – Gryffin would sleep at the foot of the bed sentry-like; he was part watchdog. No, Galen seems to now prefer the family room and her crate over the master bedroom and our bed. Last night I tried to lure her out of her crate and upstairs with a cookie, but apparently, the treat wasn’t tempting enough because she stayed put, and the treat still sits on my nightstand. When my children were toddlers and they picked up habits I would have rather they hadn’t, a wise woman – my mother — said to me, “This, too, shall pass.” And the habits did pass, only to be replaced by others that also, in time, went away, only to be replaced… Another of those circles of life, I suppose. I know Galen loves me. She wags her tail when I walk into the room, and she whimpers and whines to welcome me home whether I’ve been gone for an hour or a day. But where she used to be a mommy’s girl, she’s definitely more daddy’s girl right now. I can only hope that this, too, shall pass. Because right now I’m feeling very dissed by my dog. This entry was posted in dogs, Galen, Gryffin, musings. Bookmark the permalink. I loved your musings on how your relationship with Galen has changed. I know what it is like to have your dog suddenly decide she’s Daddy’s girl now. You can’t help but be jealous, but you also can’t help but think your puppy is so lucky to have more than two parents to love! Thanks for sharing this. It warmed my heart. Thanks for stopping by to read the post. Galen’s still a daddy’s girl, but she’s not dissing me so much anymore, so I’m not complaining (as often). Kids — whether four-legged or two-legged certainly have minds of their own! Guess that’s why we love ’em so much. I suppose that is very true, although my kids are still too young to truly diss me. Perhaps that is yet in my future. It’s still more palatable than being dissed by your children!